There are some movies that you can watch and others that you need to experience. The 2003 independent film “The Room” is one of those films that you need to experience. Though, when I first watched this movie back in 2009 on a 35mm film print, it hadn’t yet grown to the enormous popularity that it is now. Don’t be mistaken, “The Room” isn’t an experience because it’s some kind of cinematic masterpiece but rather because it’s a disaster, one of the oddest movies you are bound to ever see. Late night film programmers across the country took hold of “The Room” and have since pushed to movie to true cult classic status, selling out midnight screeners and making director and lead actor Tommy Wiseau into some kind of legend. “The Room” is a drama about a banker named Johnny (Tommy Wiseau) who’s fiancé Lisa leaves him for his best friend Greg. It’s a simple premise, one you might find differently portrayed on late night cable television or on the Lifetime Network, made all the more bizarre because of an atrocious narrative, terrible dialogue, and awful performances. It’s “so bad it’s good” charm caught the eye of Hollywood stars James Franco and Seth Rogen who acquired the rights to the book “The Disaster Artist: My Life Inside The Room, the Greatest Bad Movie Ever Made”. 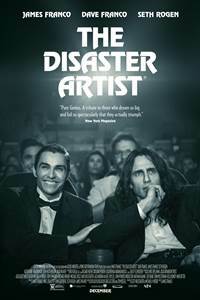 “The Disaster Artist” follows Greg Sestero (Dave Franco) on his voyage towards a career as a working actor. After some failed attempts and a few discouraging words from acting coaches in San Francisco, Greg meets an enigmatic actor named Tommy (James Franco) who provides an opportunity in Los Angeles. The two friends don’t find much success but, instead of giving up, the friends decide to make their own movie. Smartly so, Mr. Franco understands that this story is more than a comedy. In fact, much of the laughs offered throughout the film is situational; the film never undermines itself by taking cheap shots at Mr. Wiseau or “The Room”. Instead, there is a strong emphasis of admiration that is shown throughout the film by the filmmakers. While the movie didn’t come out as intended, regardless of what Mr. Wiseau may imply, there is a positive spirit that is undeniable. These are artists trying to pave their own path, utilizing filmmaking to make their dreams come true. When the comedy does take over, once Tommy and Greg begin making “The Room”, the laughs are consistent; this may be the part where prior knowledge of the original film may be most important. Still, James Franco and a familiar group of comedians bring many of the most memorable scenes from “The Room” to life. The timing, tone, and texture of the original film are impressively recreated. James Franco provides enough exaggeration to the character to amplify the comedy of the scenarios. What makes “The Disaster Artist” such of unique and heartfelt film is how it treats and portrays the ambition of the characters, their journey displays a friendship grounded with mutual motivation and respect for one another. That’s admirable regardless of how bad the final product they created is.